Natural horsemanship is a distinctly American method of horse training that emphasizes gentle handling and relationship with our horses. Through careful observation of America's wild horse herds and the interactions of mares and foals, trainers including Tom and Bill Dorrance, Ray Hunt, and Buck Brannaman developed methods that work fabulously. 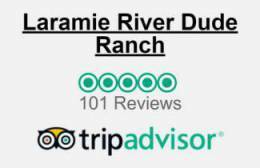 We want you to have the vacation of a lifetime. 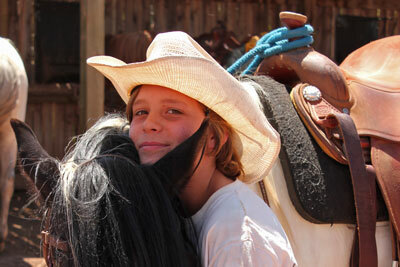 Having a relationship of trust with your horse is key to a safe and enjoyable experience. 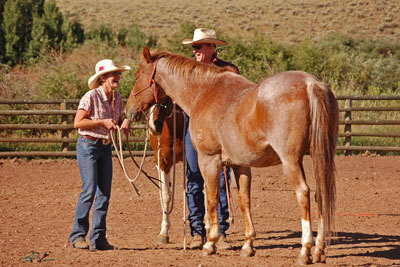 Horses raised with natural methods are calmer around people and more at ease out on the trail. We provide weekly Natural Horsemanship demonstrations followed by opportunities for our guests to do some ground work with their horse. Get a glimpse of how young horses are trained to accept the human hand, grooming, and saddling. 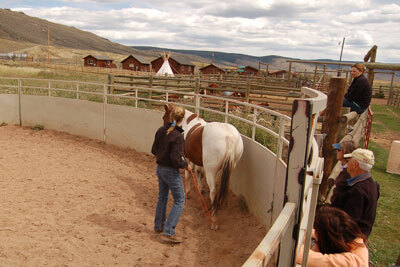 The foundation of Natural Horsemanship is built through ground work - the person works from the ground with the horse on a lead rope or free in a round pen. Ground work is lots of fun and sorely lacking from many equestrian educations. How often do you get time to love on your horse?